Car dealer shop, 1 And 2 Automotive, has put their new signs up finally. They have a team with skilled mechanics in order to provide professional services to customers. Please visit the official website to obtain more information about benefits they provide. Giant Sign manufactured & installed total five new signs, three sets of wall signs and two pole signs refacing. Welcome to the family! It is always happy to work for the returning customers such as this, Don Carro located at East Northwest Hwy. Giant Sign fabricated total two of gigantic wall signs and refaced the existing double-sided pole sign. We made one set of individually LED illuminated channel letters on backplate for ‘DON CARRO’ and another set of individually LED illuminated channel letters on raceway for ‘WELCOME TO THE FAMILY’. For the pole sign, we repainted the entire structure with bright red color and put up the new lexan panels after got the lighting repair job done. This is an Adult Entertainment Store treating all sorts of marital aids and adult novelties. Zone D’ Erotica is Giant Sign’s another long-standing customer. They requested for refacing the old, tattered faces of the pole sign. We used digitally printed flex face material for the new faces. Giant Sign also fixed the lighting, and repainted the pole and the cabinet of the sign. Riya Travel & Tours Inc in the city of Irving provides great deals on international, domestic flight bookings. If you are looking for a flight ticket with competitive price for your summer vacation , you should give them a try! Giant Sign fabricated and installed a wall sign for Riya Travel on December 2015 in the city of Irving (the completion photograph is attached on this post), and recently received another sign request from them. There was a tall pole sign, and the height of the original sign was over the maximum 35ft of city regulation. Thus, we had to remove and re-weld the existing cabinet signs to lower the overall height. We painted the pole sign with the vibrant red paint as requested to match Riya Travel’s signature color. If you are thinking of re-configuring or fixing your existing freestanding sign such as monument and pole, give us a call to (972)247-4404. Giant Sign will provide a free quote with competitive price. Giant Sign made & installed the attached wall sign for Sprint in November 2015 located in Lake June Rd. The customer was satisfied with the wall sign and requested for another sign to put up on the pylon structure in front of the store as shown above. It is always happy to work with long-standing or returning customers like Sprint. We recently finished this classic looking freestanding, monument sign (multi-tenant). 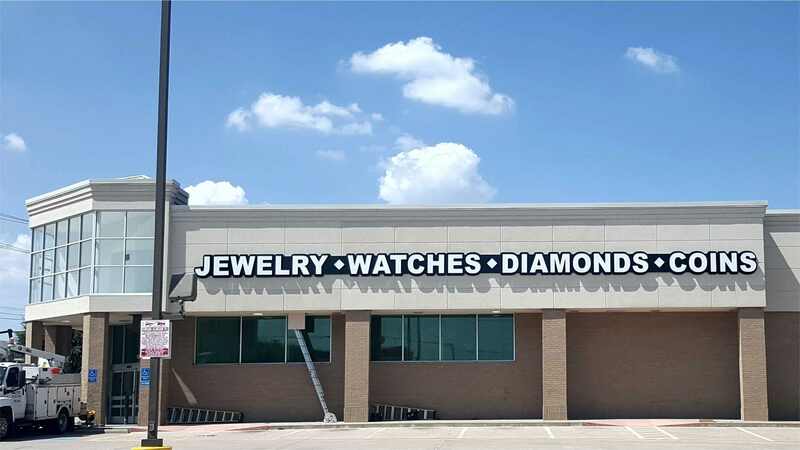 Featuring a mixture of split faced block base, stepped brick spacing and a top capper – all surrounding the internally LED-lit double-sided cabinet; the process of Giant Sign working with the Las Colinas Association very closely, resulted in a new, larger monument sign that now closely compliments the look of the entire shopping center.